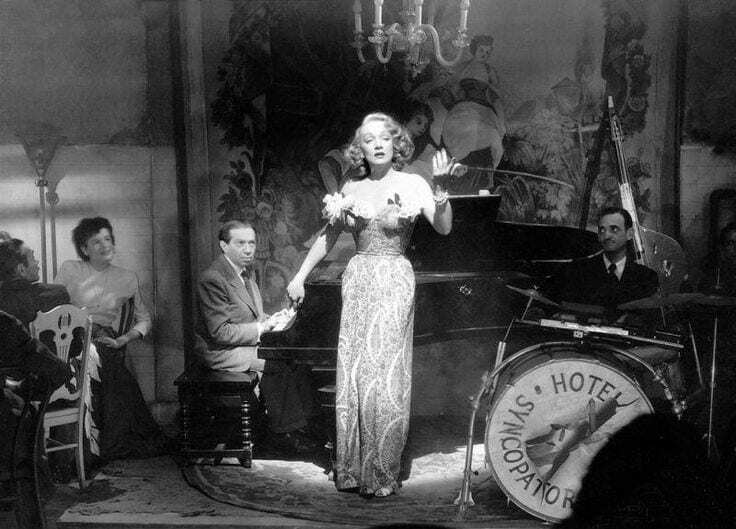 Caption: Marlene Dietrich with Friedrich Hollaender sitting at Piano. Our first ‘Comedy and Cabaret’ Week of the year is in full swing at Jubilee Lodge and it’s got us feeling rather nostalgic. Inspired by the glitz and glamour of the ultimate stage show decade, we’ve asked our brilliant guest writer Shirley to tell you all a little more about her family history, musical roots and her memories of creating cabaret style performances while attending music school. ‘Life is a cabaret, old chum, so come to the cabaret’. If like me you love classic films, you’ll remember Liza Minelli bringing the Broadway musical ‘Cabaret’ to the Big Screen back in 1972. This has got to be one of my all time favourite film quotes, and in many ways I agree with its sentiment. I am very fortunate to have been born into a musically-minded, talented family. My uncle, Friedrich Hollaender, was a very famous composer during the Second World War and was responsible for writing the musical soundtrack for the 1930s film ‘The Blue Angel’ – including ‘Falling in love Again’, sung by the wonderful Marlene Dietrich. During his career as a composer, my uncle wrote many other cabaret songs and put together over one hundred and twenty Hollywood film scores! Perhaps it’s a little more clear now where my love of music comes from and the reasons why music is in my blood! One of our most prized family heirlooms is the Hollaender wartime Steinway Grand Piano, which was once broadcast as part of BBC Radio Four’s ‘Home Truths’ programme, many years ago. As part of my Music Degree at Dartington College of Arts back in the 1980s, I conceptualised and artistically directed a musical play entitled ‘Cabaret’ as part of my studies. It was a wonderful experience – I designed every aspect of the mis-en-scene, including the actors’ and actresses’ costumes. I also gave my audiences the full cabaret experience, setting my performance in a medieval dining area, with a large grand fireplace and staircase. I even put on an authentic German feast – from Frankfurters to Sauerkraut, Pickles and Black Forest Gateau! I wanted to immerse my audience in as much of the cabaret as possible, to be able to relive a historical period in time and become truly captivated by the theatre experience. If you would like to experience our Comedy and Cabaret Week for yourself, let us first give you a taster of what to expect here.